The average cost of memory care in Monmouth County is $5,730 per month. This is higher than the national median of $4,650. Cheaper nearby regions include Middlesex County with an average starting cost of $5,647. To help you with your search, browse the 28 reviews below for memory care facilities in Monmouth County. On average, consumers rate memory care in Monmouth County 4.7 out of 5 stars. Better rated regions include Queens County with an average rating of 5.0 out of 5 stars. Caring.com has helped 9 families in Monmouth County find high-quality senior care. To speak with one of our Family Advisors about memory care options and costs in Monmouth County, call (855) 863-8283. Monmouth County, located along the New Jersey shore, is considered part of the greater New York City metropolitan area. In New Jersey, over 180,000 residents have been diagnosed with Alzheimer's or dementia, diseases that affect the 65 and older population. Monmouth County, with a population of 628,000, has 101,000 residents 65 and older. Out of those seniors, 12 percent have been diagnosed with a cognitive ailment. Monmouth County is home to 16 memory care facilities that care for and treat these people. Dementia Care Homes is the official name in New Jersey for these facilities that are licensed and regulated by the state's Department of Health. The cost of living in Monmouth County is nearly double the national average, calculated at 141 and compared to the base of 100. Housing costs, at 215 compared to 100, are the main reason for this high average. High housing expenses may increase operating costs for memory care facilities and the fees that residents pay. Families on a budget may want to consider this when looking at facilities. Healthcare costs, however, which are important to many seniors, are slightly lower than the national average at 97 compared to 100. Monmouth County residents enjoy all four seasons, with cold winters and lots of snow. January lows regularly drop into the teens and 20s. Summers are mild and humid, with high temperatures rarely climbing over 90 degrees. Seniors who are sensitive to high heat may find relief here, although the cold and damp winters may aggravate health conditions of others in memory care. New Jersey does not levy a state income tax on Social Security income, although IRA withdrawals and other retirement income are taxed on a sliding scale. Families budgeting for a loved one's memory care may wish to account for retirement withdrawals when shopping for facilities. Monmouth County is home to world-class medical facilities, including those specializing in brain health and dementia, such as Hackensack Meridian Health Bayshore Medical Center and Monmouth Medical Center, in the event of medical emergencies or illness. Memory Care costs in Monmouth County start around $5,730 per month on average, while the nationwide average cost of memory care is $4,799 per month. It’s important to note that memory care rates in Monmouth County and the surrounding suburbs can vary widely based on factors such as location, the level of care needed, apartment size and the types of amenities offered at each community. 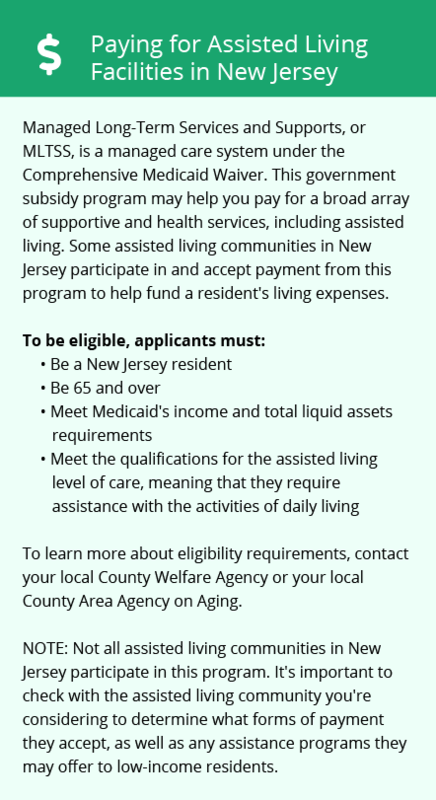 Monmouth County and the surrounding area are home to numerous government agencies and non-profit organizations offering help for seniors searching for or currently residing in an assisted living community. These organizations can also provide assistance in a number of other eldercare services such as geriatric care management, elder law advice, estate planning, finding home care and health and wellness programs. To see a list of free memory care resources in Monmouth County, please visit our Assisted Living in New Jersey page. 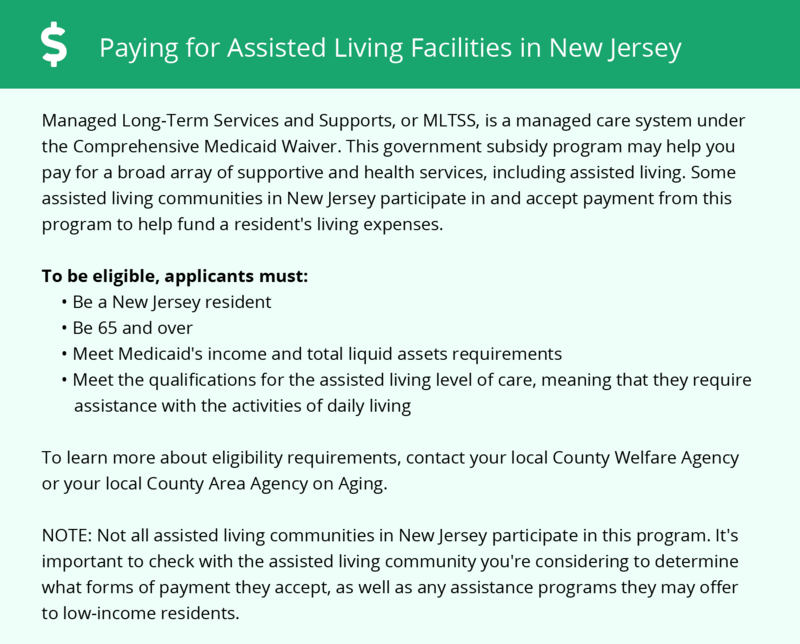 Monmouth County-area assisted living communities must adhere to the comprehensive set of state laws and regulations that all assisted living communities in New Jersey are required to follow. Visit our Memory Care in New Jersey page for more information about these laws.